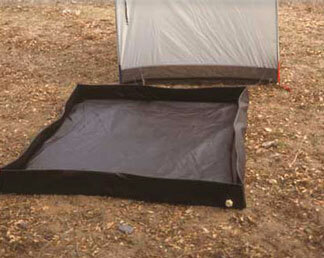 Optional Paha Que Tepee Drain Capture Floor to catch shower water when used in campgrounds where shower water run off is not allowed on ground. Standard 5/8" male hose barb with end cap will attach to any garden hose for emptying. Made for the Paha Que Tepee but also works with the Zodi Hut and Outback Porta Privy. Designed to attach to any standard-sized garden hose. Made of high density 150D polyester oxford weave, with heavy-duty polyurethane waterproofing. Simply set the Drain floor under your shower tent and attach a garden hose to the floor fitting and direct the hose water to a container. Measures 54" x 54".